Hjalmar Johnsen was born on November 20, 1919 in Brooklyn, New York. He is one of eight children of Olaf and Martine Johnsen. Hjalmar joined NY National Guard in 1939 and was assigned to Troop C, 101st Horse Cavalry. After the Pearl Harbor attack, Hjalmar’s unit was nationalized and he applied for and joined the Army Air Corps. 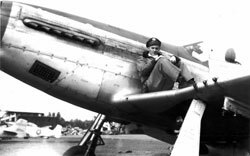 Hjalmar learned to fly in a Stearman PT-17, took Basic training in the Vultee BT13A and Advanced training in the North American AT-6. He graduated flight school in July 1943 and was assigned to 370th Fighter Group, 401st Fighter Squadron, of the 9th Air Force. 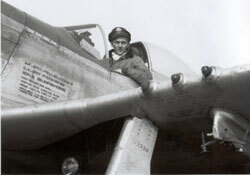 Hjalmar trained in P-47s for deployment to Europe. After arriving in Andover England their group transitioned to P-38s in preparation for the Normandy invasion. 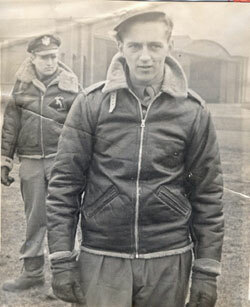 Hjalmar flew over 64-ground support combat missions, most of which were in his plane "The Brat". On October 4, 1944 while on a bombing mission “The Brat” was hit by ground fire. He bailed out over Belgium sustaining a broken leg and was picked up by Americans near the front lines. 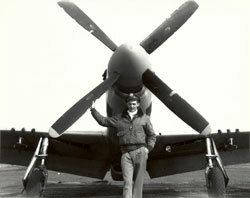 In March, of 1945 the 401st received their new P-51s, which they flew until the war ended. The P-51 Hjalmar flew is 44-72339, and is on display at the Cavanaugh Flight Museum. 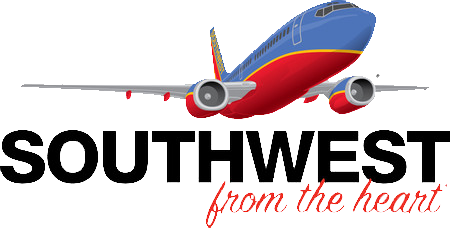 He returned home and married Rita Mederle. They had two children Jal and Lynn. He retired from United Parcel Service after 30yrs. Hjalmar Johnsen passed away on March 12, 1999. Decorations: Purple Heart and the Air Medal with 10 clusters.